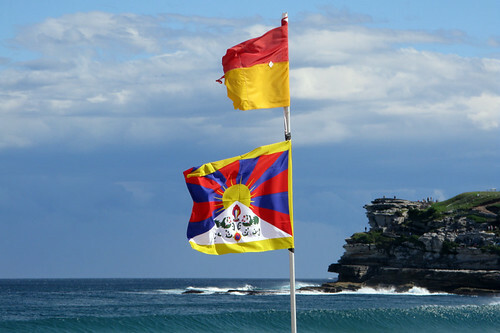 sunday 31 january 2010 – spent the day down at bondi beach pavilion where the gyuto monks of tibet have been in residence since january 19, presenting a program of public talks, meditation, art classes and other buddhist cultural activities. 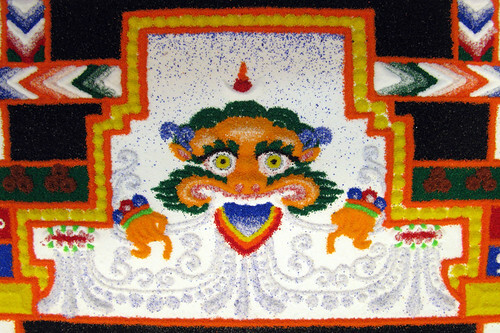 At the centre of the program was the careful creation of a large sand mandala of chakrasamvara – the monks worked in series, constantly, for many hours each day using their unique brass applicators to prepare the intricate symbolic design, working out from the centre to the periphery of the series of concentric circles. On the final day, the mandala is ritually destroyed – a demonstrative symbolic act of non-attachment pointing to the impermanence of all things.